Thank you for signing up for the J.E.Moores Mailing List. A reading from my book, Snotgrass. I always wanted to write a humorous memoir about growing up in Maine during the late 60’s and early 70’s, and so I did with my first book, Snotgrass. This is a reading from the first chapter in that book called, Meet The Flanders. I was born in 1964. It was a really crazy time in history. Maine seemed isolated from the violence of the civil rights movement, the assassination of JFK, and the sexual revolution. Maine seemed more like Norman Rockwell’s 1950’s. An idealized world where kids still walked to school all by themselves, and played outside with other kids unsupervised until dark. We didn’t have seat belts, the internet, iPhones, or YouTube, and we were just fine. I was in love with comic books, MAD magazine, Sid and Marty Krofft’s Land of the Lost, Godzilla, Planet of the Apes, building tree forts, and writing and drawing our own comic strips during study hall ~ or we’d skip recess like total geeks and draw in the school’s library! I still love to draw comics. I have been an arts and crafts camp counselor for most of my summers since 1984. Working at summer camps along the lakes of Maine have been the best days of my life. First, I like working in the art room with kids so I can steal all their great ideas. Second, I now have friends from all over the world, and camp friends are the best friends ever! Over time my own daughter became one of the campers, so here we are getting into two generations at camp! I am such an old timer there. Part of my job is to set up camp early in the season. I go ten whole days before my family joins me. I get camp and the art room ready while my daughter and wife stay home until it’s time for everyone else to arrive a week or so after me. Our time apart happens to fall on Fathers Day, so each spring as I pack up to leave for eight weeks of camp, we have an early Fathers Day celebration before I go. In our kitchen there is a chalkboard. I’m a great cook, but I’m a horrible namer. Even worse, I like to write the horrible titles of my entrees on this chalkboard. My version of Emphysema Lambada is delicious; it just has a horrible name. I don’t go a week without making a big batch of Bodarg-a-larg. The kids love it. I think you would, too. Often, after a meal, I like to doodle on the chalkboard. One night before I went off to camp, I wanted something fun to leave behind. I wanted to draw a new character. I remember it well. I wanted to make the simplest creature I could. Sort of a Yupapotamus body mixed with a Swamp Bogger face… but simplified until it was only what it needed to be. I started to draw a rectangle with a face, but I gave it four little stumpy legs. I wrote “Don’t Get Weird” under it. Wiggly Loaf was born on our chalkboard. We had our Fathers Day party and all went off to sleep so I could get up early for that long drive to camp. But you know what? By morning that crazy daughter of mine had stayed up late and felted a nifty plush version of Wiggly Loaf for me to take to camp. It was my Fathers Day gift so I wouldn’t be all alone my first week of camp. I had Wiggly Loaf to keep me company. When I got to camp I was so taken with the Loaf my daughter made, I decided to make “Don’t Get Weird” posters and put them up all over camp. That way when she got there, she would see Wiggly Loaf everywhere, kinda in response to the life she gave the character by taking the time to make me one. If I needed to make a sign that said, “Please wash your paint brushes,” I drew Wiggly Loaf saying it. In no time Wiggly Loaf was friends with everyone and became mascot of the Arts and Crafts room. Soon campers were making Wiggly Loaf comics, plush toys, necklaces, hand carved stamps, and screening T shirts. 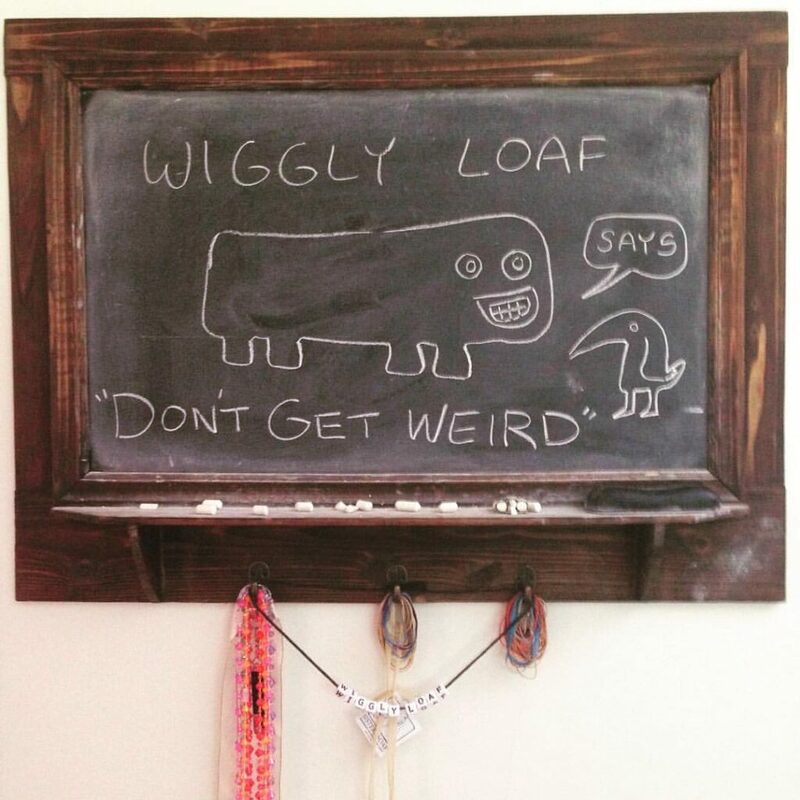 When other people wrote notes or made signs, they included their version of Wiggly Loaf. The character is simple enough for anyone to draw that it took on a life of its own. 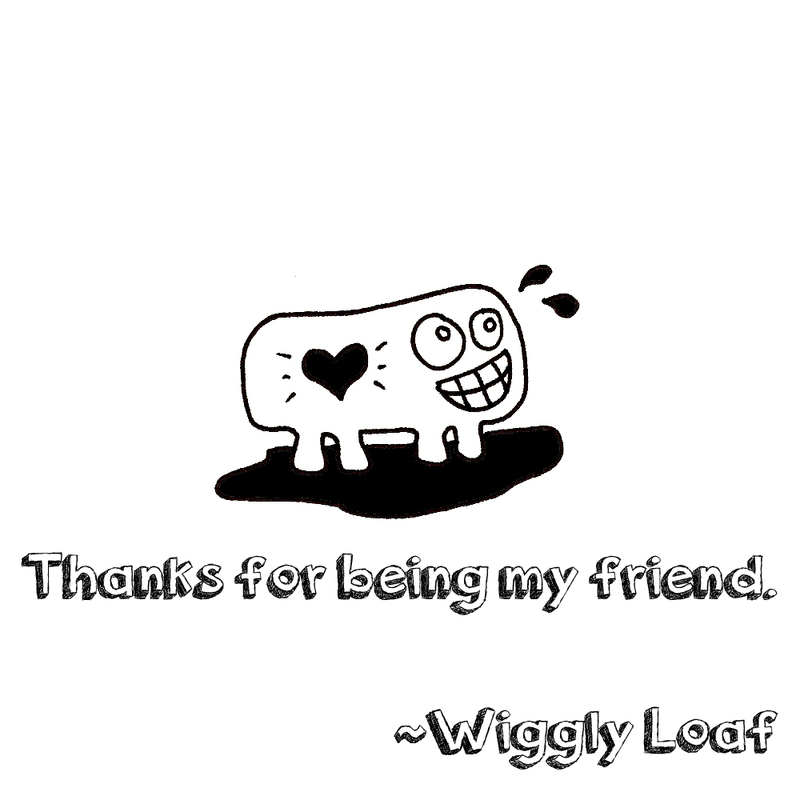 I made hundreds of #wigglyloaf memes during the winters to stay in touch with my summer friends. Several years later, the Loaf is going strong. I thought it would be fun to make a video game, so my camp friends could get in some quality Loaf time this winter. Because Wiggly Loaf was born from love I wanted to be sure the game contained all of the essential elements to capture the pure Wiggly Loaf vibe. The game has to be non stressful and pleasantly challenging. Appropriate for all ages and skill levels. Funny, cute, or even better, kawaii. I didn’t want there to be any hurry. No timer, no rush, just zen comic mayhem. The background does not automatically scroll by, so you can go at your own pace. After making Wiggly Loaf memes for years, I wanted the game to also contain positive affirmations so the player is congratulated for clearing levels and being so skilled. There are even friendly reminders to do your homework, which amuses me to no end. I wanted the game to be uplifting and fun for both parents and kids, so the homework reminders are a big hit. Oh yeah, I decided the game must be set in a chalkboard world, where it all began! Nothing in the game harms you. Instead, you’re the problem! You only get in trouble when you step on the flowers or fall off the platform into the pit of doom. You must figure out the challenging puzzle of each level, dig tunnels, build stairs, and collect hearts along the way to open up new levels of the game. When you get far enough, there are new characters to unlock, so you can go back and play the different Wiggly Loaf variations. Because it’s an indie game that I personally grind out myself from a dirty little machine in my basement, I can do things like publish shout outs during each upload for all you Loafers. People love seeing their secret messages and personal jokes in a game! It’s really cool. Want a shout out added to the game? Contact us through the WigglyLoaf.com web site, and we’ll see what we can do. The game keeps growing. I love to sit down and design new levels for the game to keep it fresh. Do a search for Wiggly Loaf on the iOS app store or for Android at Google Play, and keep the app updated to get new content as the game grows. Don’t Get Weird ~ Get Wiggly! 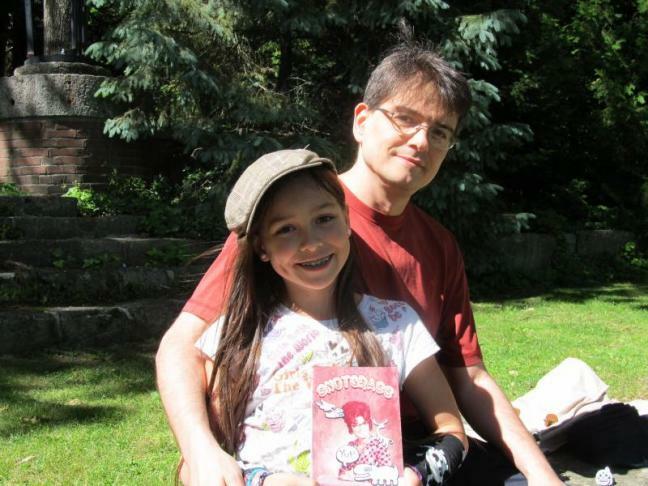 Kay Stephens was kind enough to photograph and interview Malaya and I now that we’re conducting book readings of Snotgrass. Check out the Pen Bay Pilot’s article! Snotgrass is available as a paperback book on Amazon for only $6.99 – buy several copies and hand them out to all your weirdo friends! Yeah! 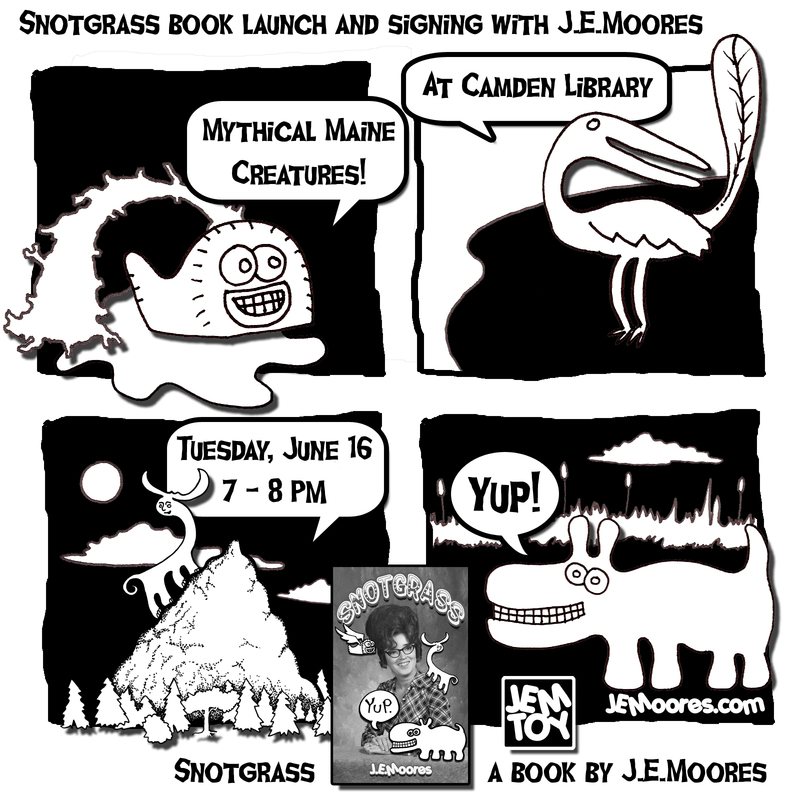 I will be at the Camden Library reading excerpts from my book Snotgrass on Tuesday, June 16th from 7 – 8 PM. Paperback books will be on sale at $6.99 each. 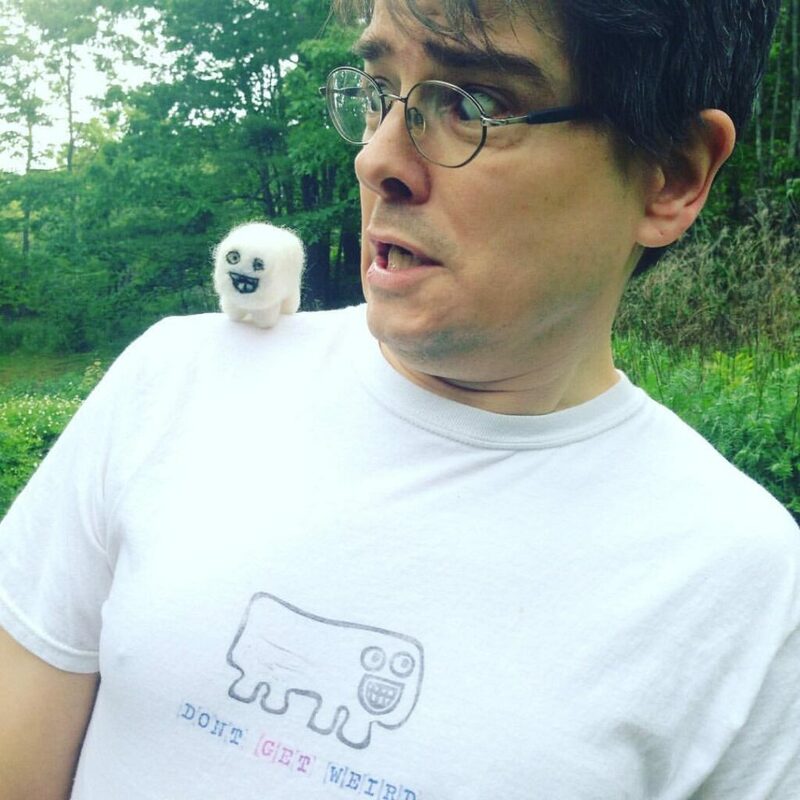 If you want, I’ll draw critters and sign ’em for you. Hope to see you there! Malaya and the Sock Monkeys – the sock monkeys have lost their jelly beans! The Beating of the Child ABC’s – this book is intended to warn the wee ones of all the dangers in the world to avoid. Birdie Builds A Nest – paperback – kindle – apple ebook – a bird has to be fierce. Although this looks like a kids book, this is really for folk just taking on a major leadership role. Narrative Toy Photography – I collect toys so I can take odd photos of them. This book is set to be a free eBook for iPad download for you to enjoy. GOF – a cute fuzzy guy searching for truth but settles for a glass of water. Many of my resin toys are based on these characters. Podlings and Gompers galore! Pacifica Art – art ideas and instructions for 1st & 2nd grade kids. This was a project I did with a group of students and at the end we had this book. I have taught arts and crafts since 1984, and these are some of the happy faces I get to see. 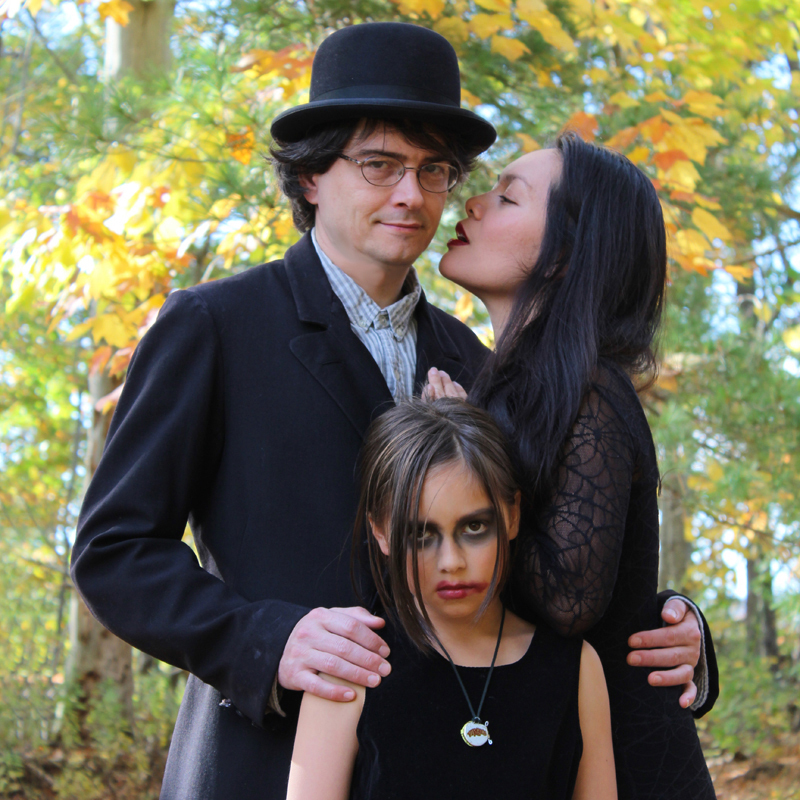 Cranford Lodge – classic haunted house ghost story set in Maine. 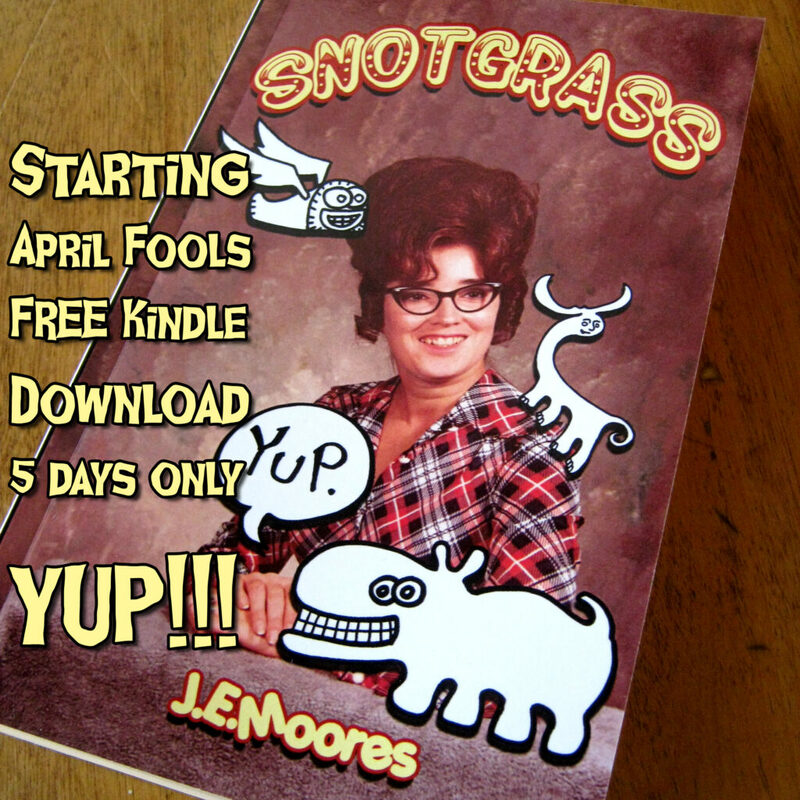 Starting April Fools 2015 FREE Snotgrass Kindle Download 5 Days Only! Here it is, my crazy book Snotgrass available now as a Paperback or Kindle download. 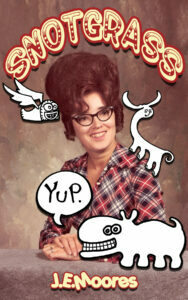 Full of Maine Humor, Bouffant Hairdos and Mythical Beasts. So I’ve been typing my guts out this long harsh winter of 2015. My family and I returned to Maine after living in California for so many years. Been here almost two years now, and one of the reasons I moved back home was to get in touch with a story I’ve wanted to tell my whole life. It’s my unauthorized autobiography that has been sitting there on a shelf in my mind all this time. No matter what has happened to me over the years I’ve put it into context in this manner: does this make it to the book or not? I have found my nonexistent book got me through the toughest of times, because I could say to myself, at least it will make a great chapter in that book I’ll write some day. To get me there I have drawn comics, made toys, and used these items to workshop my ideas. Whether playing with plush Swamp Boggers on the floor with my wee one, or making resin toys of the silly Yupapotamus, it was all a path to the story I want to tell titled, Snotgrass. This epic Maine adventure is over 50 years in the making. I can’t wait until I write it.